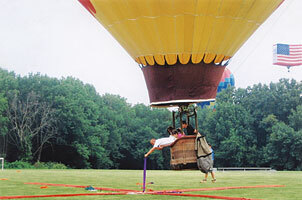 Above & Beyond Ballooning offers hot air balloon rides in New Jersey and Pennsylvania. Our main hot air balloon flight location in picturesque Readington, NJ is conveniently located just one hour west of New York City and about an hour from Philadelphia. We are the closest hot air balloon company to NYC and Long Island. Our hot air balloon rides in Pennsylvania are located approximately 45 minutes west of Philadelphia in the rolling hills of scenic Chester County. We operate our hot air balloons in NJ & PA seven days a week, with balloon flights scheduled twice daily, weather permitting. Our hot air balloon flying season is during the summer months of good weather from June through September. 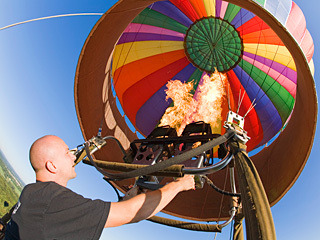 Special Hot Air Balloon Adventure Flights over New York City and other exclusive locations are available for a premium. We are the only balloon company in the world to offer hot air balloon adventure flights above NYC. To view a complete list of past balloon festivals we've attended, click here. Jon Radowski makes a perfect 0'0" score on the Saturday morning target at the 2005 Quick Chek NJ Festival of Ballooning! Depart on a hot air balloon ride in NJ! Photo Gallery: Hundreds of high-quality hot air balloon Pictures from local New Jersey balloon rides and special events around the USA. We update our gallery very frequently, so check back often for new hot air balloon photos! Ballooning Basics: Who, What, When, Where, Why, How... Anything you ever wanted to know about hot air ballooning in NJ but couldn't find anyone to ask! Frequently Asked Questions and much more about hot air balloons. Geography: Don't know where the action is? Click here to find out when and where hot air balloons fly in New Jersey! Balloon Links: An assortment of quality links devoted to ballooning in New Jersey and other related subjects. Join The Club! GEBA is the Great Eastern Balloon Association, and is a great club to be involved in. Visit their site to see why you should join. There are a number of other features on their website, including a hot air balloon festival and event calendar, great photo gallery, hot air balloon ride directory and much more. I hope this website proves informative and spurs your interest in the amazing world of ballooning. Join us up there sometime for a hot air balloon ride! Hot air balloon rides in NJ, PA & NYC - Hot Air Ballooning in New Jersey, New York City & Pennsylvania, including such hot air balloon services as champagne balloon flights, engagements, weddings, anniversaries, birthdays, gift certificates, hot air balloon sales, corporate hot air balloon advertising, balloon flight instruction, aerial photography and more! We're the launching point for your NJ / PA balloon ride.